Hanging folders are great because the sturdy hooks on each side are designed to slide along the tracks in your filing cabinet, making it easy to flip through your folders and find what you’re looking for. Many of these folders feature slots for removable tabs that can be fastened to the top of your folder, so you can label each one and identify the contents at a glance. Plus, since these tabs are removable, you can reuse the same folder again and again for all your projects. Also make sure to check out other great items from Acco, find It, HON, Pendaflex, Smead and Universal. 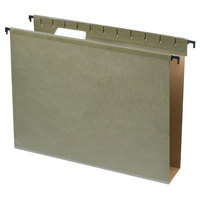 Hanging file folders are a great solution for your office organizing needs. Since they come in a standard size, they can fit perfectly in your filing cabinet or desk drawer. Best of all, most of these folders feature slots for removable tabs that can be labeled to indicate the contents of each folder, making it easy for you to find the documents you’re looking for. Don’t forget to check out other products designed to keep your office organized, including desk organizers, file storage, and filing accessories. If you're wondering where to buy pendaflex hanging file folders, we have a large selection of pendaflex hanging file folders for sale at the lowest prices.